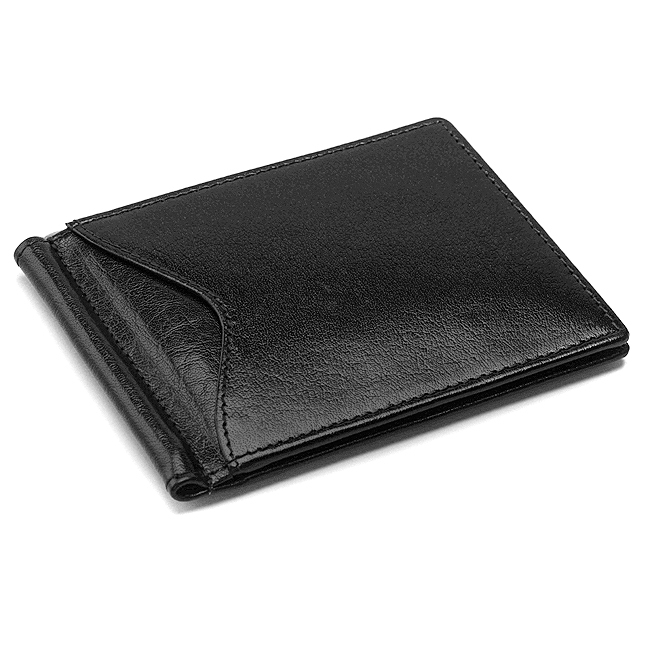 Show them you have it all together when you take out this smart leather bifold wallet with money clip! It's slim, fits flat in your pants or jacket pocket, but don't let it's slim appearance fool you! Inside are 6 slots for credit cards and along the crease is a a goldtone hinged money clip that holds 10-15 bills! 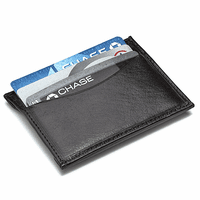 There's an additional slot on the outside for a credit card or business card for easy access. This bifold wallet comes in black or brown leather, is packaged in a gift box, and can be hot stamped with up to 4 letters on the lower front corner to personalize your gift! To add free custom personalization, just enter your lettering in the personalization field above. Dimensions: 3 1/4" x 4 1/4" x 1/4"
Yes, all the letters are one size. So enter them in this order: First Initial, Middle Initial, Last Initial. Is there an ID window on the outside or inside of this wallet? 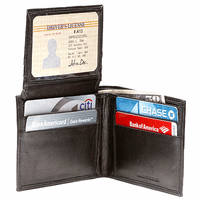 No, this wallet does not have an ID window. Will you be getting the Coco color back any time soon? I got it for my husband about two/three years ago and he LOVES it, but it's starting to wear out. He wants me to get a couple. 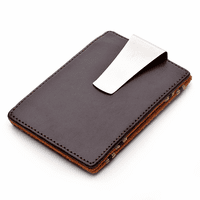 Yes, we have a shipment coming in hopefully within 2 weeks for this money clip wallet. As soon as we have it back in stock, we'll have it available to order on our site. What was the date that the previous question was asked. I too would like the brown one and was wondering if they would arrive in time for Christmas. We can't guarantee it but we're hoping to have this item in stock on or about the 14th. The second we have it in our warehouse, we'll have it live on our site. It ships the next business day, even with personalization, so as long as there are no delays with our shipment, you should be able to get this before Christmas. I am trying to get either "Lorenza" or "Strother" on this, and when I hit preview it will not display the last letter of the name I want. Is it possible to do that many letters? No, sorry, that wouldn't fit. We normally only personalize our leather products with either 3 initials or a short name, usually not more than 5 letters. Please give the dimensions. Is this model usable comfortably in the front pocket? Found that if certain cards will loose swipe function if strips face each other. Like the divided card sections on clip with out fold. The dimensions are 3 3/8" x 4 1/4" x 1/4". This can definitely fit in a front pocket. It is fairly thin for all that it can carry. We have not found that the swipe function is effected with this model. What is the weight of this wallet? This wallet weights about 4 ounces. Is it possible to have personal message engraved inside this item? No, sorry, we can only emboss initials on it. We could do the embossing on the inside for you (up to 3 letters). If you'd like to do that, just let us know in the comments section of the checkout page. Very good quality product. Clip is nice. With a full load of cards (about 9 cards filling up all the slots) the total width comes up to about half an inch. The clip seems very sturdy. I purchased as a Valentine present and he loved it. He had been showing it off and loves that it's personalized. Customer service was AWESOME very friendly but yet professional. I will be using them again!!! My husband has had the same money clip, from Nautica, with four card slots for about 10 years. He wasn't able to find one like it since and hung onto his old one because of it. I found this wallet and it is identical except it has 6 card slots instead of 4, making it slightly bigger in the length and width but not in the depth. The wallet is still super thin, which is what my husband wanted. I surprised my husband with this for an early Valentine's Day gift and he absolutely loved the monograming on the front with his three initials! That adds a nice personalized touch. Here is to another 10 years! I got 10 years out of my first one. I just ordered my second. I hope they are still available in 2027. Ha! Best wallet I ever had. Quality, fit, good compartments, orig bought 2 of them. The first was ready to retire, but used a gift metal case that could only hold 1 bill in order tonshut for 6 mos. Bulky, dropped it once and everything slid across the floor in a big box store. Will change to my second in waiting of this wallet this weekend. You will not be sorry, fits well in front pocket when needed, I usually carry in messengers bag. Going to order a spare now so I will be at the ready when needed. Hit the buy button NOW ! 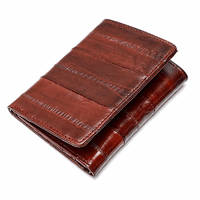 ConsNone for me and I have bought wallets for over 50 years. I've had this wallet for a few years now. 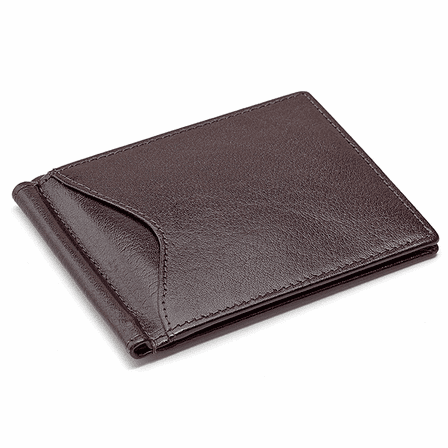 It's a great slim wallet with plenty of space if needed- there's even hidden pockets behind the card holders. Attractive and personalized. Easy access to ID is great, too. I actually came on here because over time the money clip came loose, so I figured it was time for a new wallet. After looking around I saw another wallet with a money clip and in the features it said to twist the money clip to adjust tension. I figured why not try it on this one that I already own. Flipped up the clip, and twisted it around several times clockwise. Voila! The clip is almost like new and will certainly keep my bills in place. Looks like I still have a couple more years left in this guy after all. Overall, an attractive, functional, slim wallet that's well made and lasts forever. If you're thinking about pulling the trigger on this, do it. You won't be disappointed. ConsMoney clip can loosen over time, but a few clockwise turns will fix that! Cards. A little larger than I expected. This purchase was a very pleasant experience. Not only easy shopping & check out but good quality, free personalization, free shipping and prompt receipt of the wallet purchased. This bifold wallet with money clip is just right. I have paid more elsewhere but the quality was not any better than this one. I purchased this wallet for my husband and had his initials put on it. The leather is very soft and looks like I paid more than I did. He loves it. Well done and shipped quicj. It was very well received and it's really quite lovely. Actually bought for my friend, but feeling surprise of the good material and outlooking. This is exactly what I needed to replace one which is falling apart. Conspockets not quite wide enough for a credit card. I hope they stretch as someone else mentioned. 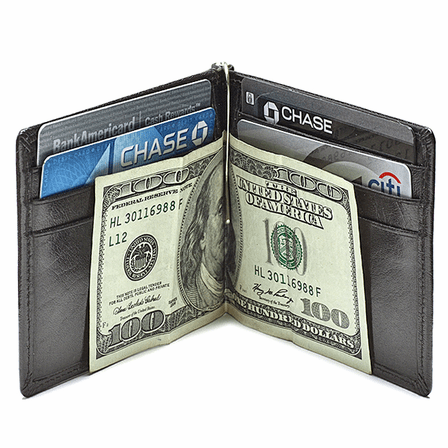 This wallet is perfect for what I need it for, carrying cash and some credit cards. I had my initials engraved on it and they look great. Merchant Response:HI Mike We're so sorry this isn't working for you. It sounds like you may have received a defective money clip. We'd be happy to ship you a new one free of charge. You could also try a different wallet/money clip free of charge. Email us at help@executivegiftshoppe.com if either of these options works for you. Beautiful, nice slim wallet-would order another one to give as a gift. This was exactly as my husband wanted, as it had the money clip inside in the center. Great price! I use this when I go out at night, is perfect for carrying cash and a few credit cards. I didn't get it personalized becuase I wasn't sure I'd like it, I wish I did get it personalized now! It' great and my husband loves it. Wish it was a little narrower and held more money without being thick. Wish the pocket was clear for the license. But, if your not looking for these things specifically, it's perfect. I wish I had gotten it engraved with initials. It was a last minute gift and I had it shipped out the next day by air. It arrived just in time. Well worth the extra money for shipping. It saved me gas, time, frustration, and stress as opposed to driving around searching for what I wanted! I recommend this product. Not bad at all. You are able to carry what you need and more. There is room for 6 cards and 1 on the out side. The money clip part is very well design. Overall is a very good wallet and money clip. ConsSlightly to big. If this was a tad bit smaller with all the amenities it would be perfect. Again, we were extremely impressed. The personalizing makes the wallet distinctive. It is a bit larger than expected and would be better if it were smaller, less bulky.